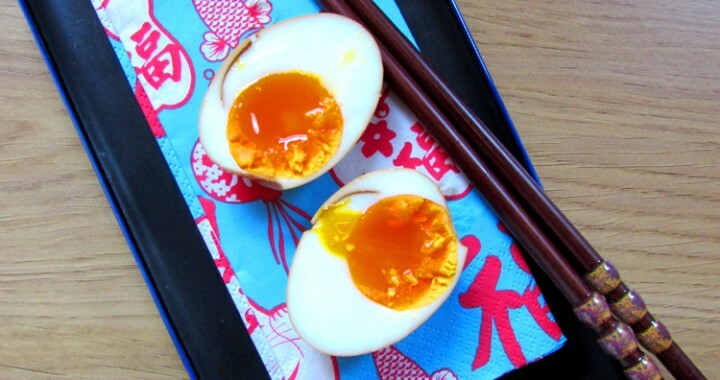 Simple in flavour and easy to prepare, yet a great addition to any bowl of ramen, the ramen egg is a salty, slightly sweet topping that you find on many bowls of ramen in restaurants. I fell in love from the first time I tried them and once I found the secret to creating them, I couldn’t believe how easy they were. They ideally need to be made the day before, so that the egg has a day to absorb the flavours of the liquid, though when pushed for a time I have made them the morning before we have eaten ramen in the evening. Ramen eggs are also great in bento boxes. Combine the soy sauces, mirin and water in a freezer bag (I use the zip-lock ones as otherwise you’ll find you’ll have a eggy smelling fridge for a day!) and place in a small bowl (too large and the liquid won’t cover the egg when you add it- I use a Chinese rice bowl). Bring water to boil in a small saucepan. You want enough so that the eggs are covered when added. When boiling, carefully lower the eggs into the water. Remove the heat so that they are on a rolling boil and cook for 6-7 minutes. You will probably need to do a bit of trial and error here- depending on the fierceness of your hob and size of your eggs. I have an electric hob and find for a medium egg exactly six minutes is perfect. Obviously you won’t know whether you have accomplished a perfect ramen egg texture until you serve it the next day! After the 7 minutes, drain the water and quickly refill the saucepan with cold water. Empty this and repeat several times to cool both the pan and the egg down, to prevent any further cooking. Refill with water again and leave for ten minutes to cool. Gently peel the egg (it will be soft so go carefully) and place the egg into the freezer bag. Make sure it is fully submerged. Wrap the bag over on top of the egg, squeezing out any air pockets and place a ramekin on top of the bag to weigh the egg down in the liquid. You can keep them in the fridge for a maximum of two days. Remove the egg from the liquid when ready to use and slice in half lengthways. If you have cooked it perfectly, the egg white should be cooked through and the yolk still slightly running in the centre. The liquid can be added to the broth if you wish or used for the soy glazed chicken recipe. Posted in Recipes, Toppings and tagged Egg, Toppings.